I haven’t been into Wakefield many times in recent weeks but I visited earlier today. I didn’t have my binoculars with me and I didn’t worry about this because it is some time since I last saw a peregrine. My assumption has been that the overwintering pair have left Wakefield to breed elsewhere. 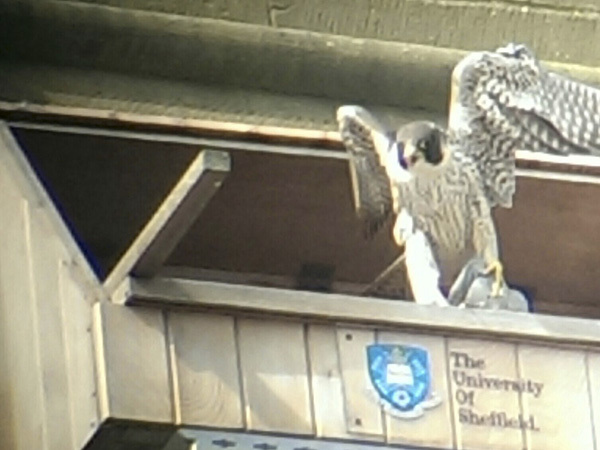 As I walked around the cathedral, I was surprised to see a peregrine sitting on the perch of the nestbox. 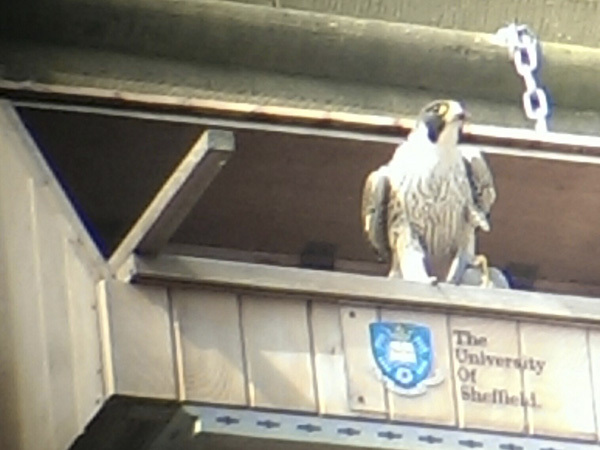 This is the first time that I have seen a peregrine on the box, though Eddie’s contact at the flats did see an immature bird on the box a week or two ago. I contacted Colin and he headed for the cathedral with his telescope. I was a bit disappointed when the peregrine flew away, towards Calder Wetlands, just after the phone call. However, the peregrine returned about fifteen minutes later, carrying prey, and it disappeared into the box. For the next half an hour, all that could be seen were feathers flying from the box. When the peregrine finished eating, it moved onto the edge of the box, where it became clear that it was an immature bird, not one of the overwintering birds. It then flew up onto the steeple with the remains of the prey and it stashed this high on the northern side of the steeple. It was interesting to see this bird because @johnnybirder contacted me via Twitter recently to report regular sightings of a peregrine at Pugneys and to enquire about the cathedral peregrines. Before leaving, Colin and I had a chat with one of the people at the cathedral and he told us that he continues to see a peregrine – presumably this one – regularly. He has seen it perching on the box and he has observed it as it took a pigeon. The attached pictures are of low quality but they were taken by phonescoping. This entry was posted in Nature notes, Sightings by Francis Hickenbottom. Bookmark the permalink.